Cats can be more than just aloof, adorable jerks, you know. They can also be Jenga masters. 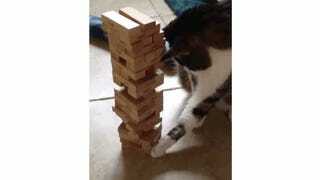 Yes, the cat might topple the Jenga tower over at the end. But you know what? The human took two turns beforehand, too. If that doesn't warrant rage quitting, I don't know what does.